Jerusalem, Israel — March 14, 2016 … No candidate running for the office of Presidency in the United States has both the documented foreign policy experience and dedication to Israel’s security as Senator Ted Cruz. “Off the charts brilliant,” is how legendary Harvard Law professor Alan Dershowitz described his former student in an interview with the Philadelphia Inquirer a year ago. 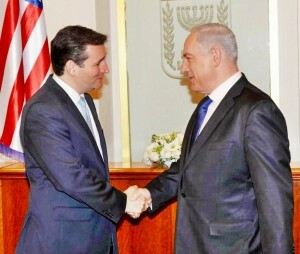 As both Republican and Democrat candidates attempt to prove who loves Israel more, Cruz has been an outspoken critic of Hamas, Hezbollah and Iran for several years. As Donald Trump could not articulate where the capital of Israel is at the recent RJC Conference and continues to state that he is “neutral” on Palestinian terror, Ted Cruz has been in the forefront of closing the PLO offices in Washington and confronting BDS in the US. “The events of the past few days – terror attacks in Israel, coupled by further demonstrations of the Obama administration’s hostility toward PM Netanyahu, reinforce the importance of this election,” said Muzin. We ask our readers to consider one last factor. Trump proposes a ban on Muslims entering the United States. Netanyahu rejected this ban as racist and stated it would only serve to create more conflict. The State of Israel does not ban religions or races of people. Rather, when threatened we enhance our security methods. By proposing a ban on Muslims, Trump has made himself unwelcome in every Arab and Muslim capital. How can a world leader effectively function as such? How can a world leader coordinate an Arab coalition against ISIS when he insults Jordan, Egypt and other moderate Arab states? The Israel News Agency proudly stands with Senator Ted Cruz.